Well sculpted and finely finished kayak hunter with two seals and a harpoon. 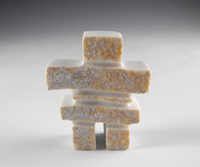 Peter is an elder who's been carving since he was a boy. Striking set of white earings artistically carved in the shape of a snow knife, out of dolomite stone and mounted on good quality gold base. 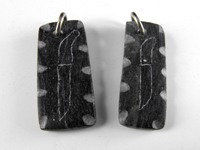 Set of black pendants inscribed with the outline of a snow knife" and set on silver rings for attaching to a necklace. 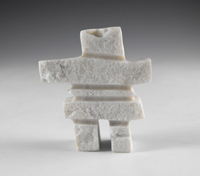 Attractively carved from black river-stone and sanded to a smooth finish.